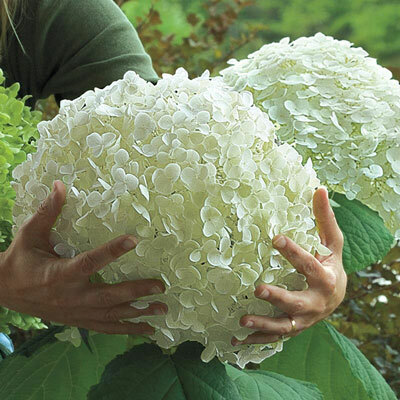 Unbelievably large flower heads will amaze and delight for up to two months, starting in midsummer. Strong stems support the enormous blooms easily— even in a rainstorm! Grows 4-5 ft. tall in full sun to partial shade. Zones 4-9. PP20571. Potted plants. For each offer ordered, get 1 plant . Depth: Same as in the pot. Color: White with a slight tint of green. 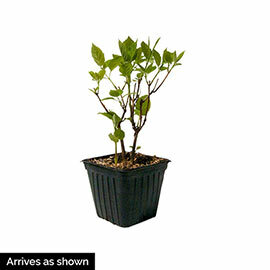 Foliage: Medium green ovate leaves. Flower Form: Large branched flower clusters 10-12 inches in diameter. Soil Requirements: Moist well-drained, moderately fertile soil. Pruning: Cut back in the Spring to promote flowering on Summer wood. Depending upon your tastes, pruning cuts can be made right down to the ground; new shoots will be generated. Size: Huge 12 inch flower heads.